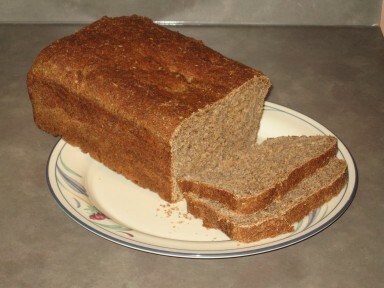 This is the third time I’ve made spent grain bread using this recipe, which is loosely based on Alewife’s. I used the Unholy Trinity grist for the spent grains, as well as the beer itself. It’s definitely a better fit for a bread recipe than the others. There’s something really satisfying and elemental about making your own bread – plus, have you seen what good bread costs at a grocery store? Fair warning, though: gastrointestinally speaking, a couple slices of this stuff is the rough equivalent of a Del Taco burrito drizzled with Ex-Lax. Proof the yeast with a teaspoon of sugar and a few ounces of warm water. Knead to combine the rest of the ingredients, and add white flour as needed until the texture is right (not dry to the touch, but no longer sticky). Pound the dough down into a loaf pan, then let it rise for 1-2 hours. Bake at 350°F until the internal temperature is 210°F, or a “toothpick test” shows that it’s done – it should be about 45 minutes.